In October 2013 the European Commission was notified by Italian researchers that the plant pathogenic bacterium Xylella fastidiosa was detected in olive trees in southern Italy. Previously absent from the EU, the bacterium is quarantined as a harmful organism and has already caused economically significant lethal diseases of grapevine, citrus, plum, peach, almond, oak, oleander, and numerous forest tree species in the Americas. In Brazil it currently infects an estimated 200 million citrus trees, for example, while in California it causes an estimated $100 million in yearly losses to the grape industry. The presence of X. fastidiosa in the southern parts of the Apulia region in Italy was first estimated to be responsible for severe disease encompassing more than 8,000 acres of olive orchards; current estimates over the last season have tripled the area now affected. Farmers’ aggressive pruning of olive trees accelerated tree decline. Olive oil production predated Roman times in this region, and many of the affected trees are hundreds of years old. Because the landscape is dominated by centennial olive trees, the impact of the introduction of this pathogen goes beyond olive and olive oil production, which has already declined in the region due to this disease. The region and its trees are a tourist destination, and the local population also has a strong social and cultural connection to olives (for example, the Apulia flag has an olive tree in its center). Therefore, there is substantial concern about the economic, ecological, and sociocultural consequences of this disease. 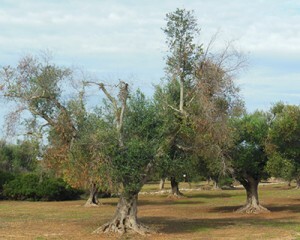 Diseased olive trees in the Apulia region of Italy. Photo by Rodrigo Almeida. Xylella fastidiosa is well known to Californians and to UC Berkeley researchers. For over 75 years, much of the pioneering research on this pathogen has occurred on the Berkeley campus. Here, its insect vectors were identified, the bacterium was first cultured in vitro, and much of its biology and ecology, especially in California, was described. Recently, Rodrigo Almeida (Associate Professor, ESPM), Sandy Purcell (Emeritus Professor, ESPM), and Steve Lindow (Professor, PMB) have been sharing what they know about the bacterium with European colleagues, from how to efficiently detect and culture the pathogen, to vector identification and the latest approaches to manage and control disease spread. In addition to the immediate threat to the olive industry in the region, Italy and the European Union are also concerned about how to limit the further dissemination of X. fastidiosa in the continent. This bacterium also affects other important crops, ornamental plants, and forest plant species. Almeida and Purcell, together with Italian scientists, belong to a committee established by the Italian Minister of Agriculture (Ministro delle Politiche Agricole Alimentary e Forestali) to provide science based recommendations to deal with the epidemic and develop research priorities. Almeida was also part of a European Food Safety Authority working group assessing the risks X. fastidiosa poses to the EU and available management options to limit its impact and spread.